Consider the humble citrus press. You cut a lemon in half, place it in a press, squeeze it (or squash it), and end up with a couple of tablespoons of fresh, delicious juice to add to your favorite recipe or cocktail. They work well for making the occasional small glass of orange juice as well, but for a bigger job, you'll want to look at electric citrus juicers. It might seem as if one manual juicer is much like another, but, in fact, many don't hold up to more than a few uses -- especially the squeeze type. A better choice is a cup-style juicer like our top pick, the Oxo Good Grips Citrus Juicer (Est. $15). It operates on hand power; you have to cut the fruit in half and press down while rotating it, but reviewers say that it squeezes out a surprisingly large quantity of juice for such a basic appliance. Serious Eats makes it their top pick after testing, and the editors of Fine Cooking say that they "frequently use this juicer in our test kitchen." It also earns a Recommended nod from another professional test kitchen. The OXO Good Grips Citrus Juicer features a two-sided auger -- one large and one small -- to handle any size citrus fruit, from tiny limes to larger grapefruit. The built-in strainer catches the seeds and most of the pulp -- although owners say that occasionally a small seed sneaks through. The clear collection cup has convenient, easy-to-read markings and the pour spout makes it easy to transfer the juice to another container. 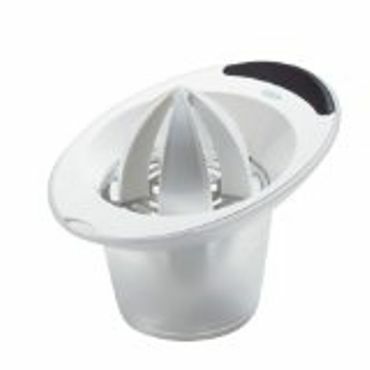 The Oxo Citrus juicer has a three-piece set up: The two-sided auger, a collection cup, and a lip to protect from spills. Most report that it's easy to assemble, disassemble and clean, while others say the double-sided auger design is awkward because the unused auger dangles into the collection cup. All pieces are dishwasher safe on the top rack. Many owners say they've had this juicer for years and it has not warped or cracked, in spite of its plastic construction. A few say they would love a glass (rather than plastic) cup, but that's not a deal-breaker. It's also super stable, users note, thanks to the rubber strip on the bottom that keeps it from sliding or tipping. If you need only the occasional tablespoon or two of fresh juice and you're short on storage space, the Bellemain Premium Stainless Steel Lemon Squeezer (Est. $25) gets better reviews for durability than most manual juicers of this style, with close to perfect, 5-star ratings from thousands of owners. They really appreciate the sturdy, stainless steel construction, which they say not only holds up better than aluminum or enameled lemon squeezers, but they also don't have to worry about flaking paint -- a common issue with painted, enameled lemon squeezers. Users also say it's easy to use and to clean -- just toss it in the dishwasher. A juicer of this type won't be as effective as juicers like the Oxo Good Grips, though; quite a lot of juice is left behind. That may not be a problem if you just want a bit of juice now and then for a recipe, but it can add up over the long term if you juice a lot. Those with a home bar set-up will want to take a look at the Olympus 97302 Commercial Juice Press (Est. $160). Yes, it's pricey for a manual juicer, but it's what restaurants and bars provide for their bartenders, and it quickly and efficiently produces a larger quantity of fresh juice than cheaper manual juicers, without tiring out your hands. Experts rave about its ease-of-use. Reviewers do note that for the price it may be smarter to just buy an electric juicer, but owners like its sleek, professional styling. A few even note that it works great for pomegranates, one of the toughest fruits to juice and something that most manual juicers simply can't handle. However, as many point out, you can buy a less-expensive centrifugal juicer or pretty darn good electric juicer for the price of the Olympus. If aesthetics aren't your top priority, the Oxo Good Grips Citrus juicer can't be beat for performance and value.